In its press release dated July 30, 2012, Cebu Pacific Air announces its six new domestic routes expected to further boost local tourism and commerce in the country. This is great news for Cebuanos planning to visit Coron. You don't need to fly via Manila or Puerto Princesa anymore, as by October 4, 2012, Cebu Pacific will start serving direct flights between Cebu (Mactan-Cebu International Airport) and Busuanga (Francisco B. Reyes Airport). Flight 5J-690 (Cebu-Busuanga) is scheduled to depart Cebu every Tuesday, Thursday and Saturday at 10:50am and expected to arrive in Busuanga at 12:30pm. Flight 5J-691 (Busuanga-Cebu) is then scheduled to depart Busuanga at 12:50pm and is expected to arrive back in Cebu at 2:30pm. Each flight has an estimated flight time of 1 hour 40 minutes utilizing an ATR 72-500 aircraft. Do you remember the days when a trip between Bicol and Leyte required a land-sea-land travel? Those days are gone! Starting October 4, 2012, Legazpi City and Tacloban City will only be a 1-hour-5-minutes flight apart using Cebu Pacific's ATR 72-500 aircraft. Flight 5J-317 (Legazpi-Tacloban) is scheduled to depart Legazpi every Tuesday, Thursday and Saturday at 6:25am and is expected to arrive in Tacloban at 7:30am. Flight 5J-318 (Tacloban-Legazpi) will then depart from Tacloban at 7:50am and is expected to arrive back in Legazpi at 8:55am. Just two weeks ago, Cebu Pacific announced its direct domestic flights from Iloilo to General Santos and Puerto Princesa. Today, Cebu Pacific introduces its direct domestic flight from Iloilo to Tacloban which will commence service on October 5, 2012. Flight 5J-156 (Iloilo-Tacloban) will depart Iloilo every Monday, Wednesday and Friday at 6:05pm and will arrive in Tacloban at 7:15pm. The returning Flight 5J-157 (Tacloban-Iloilo) will depart Tacloban at 7:35pm and will arrive back in Iloilo at 8:45pm. Passengers will be transported using an ATR 72-500 aircraft. 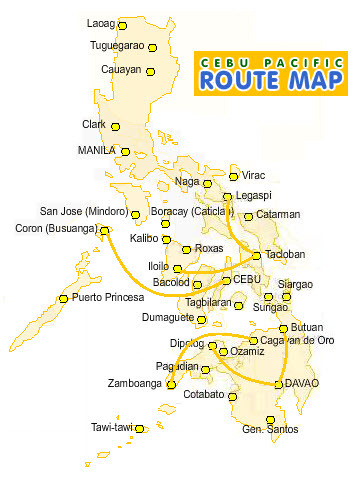 On Octover 5, 2012, Cebu Pacific will commence its direct flights from Davao to Dipolog and Butuan, increasing the number of Davao's domestic destinations to nine across the Philippines (four in Mindanao). Direct flights will cut the Davao<>Dipolog and Davao<>Butuan travel times to 1 hour 10 minutes, and 55 minutes, respectively. Flight 5J-697 (Dipolog-Davao) will depart from Dipolog every Monday, Wednesday, Friday and Sunday at 2:15pm and will arrive in Davao at 3:25pm. The returning Flight 5J-698 (Davao-Dipolog) will depart from Davao at 3:45pm and will arrive back in Dipolog at 4:55pm. Flight 5J-795 (Butuan-Davao) is also scheduled every Monday, Wednesday, Friday and Sunday, departing from Butuan at 6:30am and arriving in Davao at 7:25am. The returning Flight 5J-796 (Davao-Butuan) will depart Davao at 7:45am and will arrive back in Butuan at 8:40am. Both routes will be serviced using an ATR 72-500 aircraft. Man white water rafting ya kita na CDO! A 12-hour bus ride may be fun, but a 1-hour-10-minute direct flight on board an Airbus A319 is definitely more fun! Starting October 20, 2012, Cebu Pacific will have thrice weekly flights between Asia's Latin City and the City of Golden Friendship. Flight 5J-844 will depart from Zamboanga City at 6:05am and is expected to arrive in Cagayan de Oro at 7:15am. The returning Flight 5J-845 will depart from Cagayan de Oro at 7:45am and will arrive back in Zamboanga City at 8:55am. For the most updated flight schedules, check Cebu Pacific Air's Flight Schedules.